A decade behind us, new goals ahead of us! At the end of 2017 our charity, then known as Hyde Community Action, celebrated ten years of delivering amazing work in Hyde. A short while later there was more cause for celebration, as we started work on a re-brand that gave us a new name and lets us expand our work area to Tameside. Now known as Diversity Matters North West, we are full of hope for the future and have lots of plans in the pipeline. We have a new logo, we are recruiting staff and we are continuing to run courses and activities that empower local women and the community. 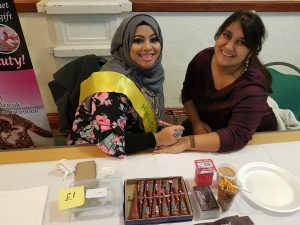 In November, coinciding with the Christmas Lights Switch On event, the beautiful Hyde Town Hall played host to our Family Fun Day where we celebrated an amazing ten years of working in Hyde. Hyde Community Action volunteers, trustees and staff had worked hard in the months leading up to the event, and put on a fantastic day. 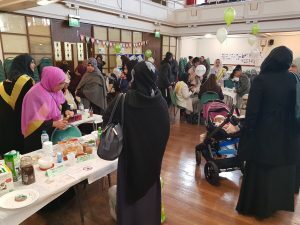 The event drew in the crowds from the community who were treated to lots of lovely food and sweet treats, great crafty activities for kids and free health checks. We also had Belinda doing balloon models, our Trustee Liza created beautiful henna art, the police came to recruit and Active Tameside offered fun challenges as well. The event also doubled up as a celebration for the Graphic Lives project which ran in the autumn. On Graphic Lives a group of ladies came together, learnt tons and created some fantastic comics about their lives arriving to the UK from Asia. 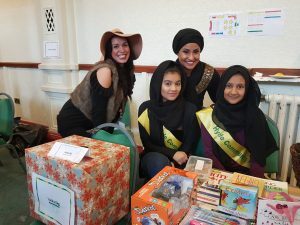 We are a charity with a decade’s worth of experience in supporting the local community to get and stay healthy in body and mind, and to improve and promote community cohesion. With a tweak to our objectives and a name change to signify this important step, we have now undertaken a re-brand that provides a platform for us to reach further into the communities we work with and support more people. Many of the people we work with are women of south Asian background. Every year we are supported by more than 50 volunteers and touch the lives of more than 300 ladies through training, social activities and mentoring projects. With this new name and remit, we hope to reach even more.